Today I presented a raw food lunch for the owners of Cups in La Jolla, a posh little joint in San Diego’s most glamorous part of town that serves the finest cupcakes made from all organic, local ingredients in a fully sustainable kitchen. Cups also boasts a fabulous teaching kitchen where top chefs offer a deliciously diverse range of classes. If you haven’t been you simply MUST stop by. Michelle & Gene are nothing short of inspiring, completely passionate about food in every stage from farm to table. It was a delight to be with them and to share a meal. The food paled to comparison to the conversation with Jean and Michell who, later tonight will host a dinner for the president of the Slow Foods Movement to tackle some massive issues that will make powerful, positive change for farmers. Despite the bigger issues on their plates, they took time to enjoy the simple lunch of raw horchata, jalapeno poppers, and tortilla soup with pineapple avocado salsa I provided for them. First they invited me to teach, joining the ranks of chefs that make me weak in the knees at the mere mention of their names, let alone the Pavlovian drooling that happens when I think of their menus. Second, Michelle decided to serve my raw version of jalapeno poppers at their meeting with the Slow Food Movement V.I.P.s. I wanted to do a cartwheel, kiss them and squeeze them til they burst. Apparently the culinary gods were smiling down upon me and gifted me the grace to smile politely and plate the food that would be enjoyed later that night. I felt like a kid in a candy store. 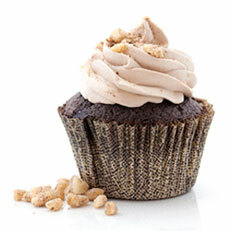 Which, in reality, was not too far from the truth, a grown up in a cup cake lounge. Instead of filling my belly with lollipops, I got to fill bellies with raw foods that I believe can impact the health of our nation. Of course I did sample their PERFECT cupcakes. Wow. Delicious. If there is a place for raw food education in a cupcake lounge in La Jolla, there is a place for more fresh, local raw foods on everyone’s plate. Check out the class schedule at Cups Lounge and stop by next time you are in La Jolla. If you can make it to the raw foods class by yours truly, I will see you there! If you can’t wait for the raw foods class in person, check out the on line crash course in all things RAW. 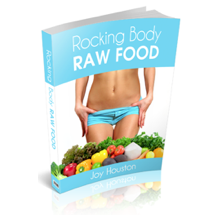 Rocking Body Raw Food guides you, video by video, meal by meal through a full two week raw food cleanse. By the end of the course you’ll be a pro at creating your own raw food meals and menu plans. Congratulations Joy! How exciting…but you so deserve the recognition. I’ll try and keep up with your work the best I can. I know you are contacted by hundreds of readers so I don’t expect you to remember me, but since the last time I was in touch my computer hard drive suffered a meltdown and all that you had shared with me is trapped on the old computer. I was excited to receive the newsletter to catch up with your work. The almond milk video was perfect except I didn’t have the required bag to strain it but absolutely amazing as it tasted just like Silk’s brand. Thank you for all you do helping each of us switch to a better diet. I remember you! It was your birthday when we last spoke. I hope you had a fabulous celebration. I can forward our conversations to you if you’d like. Did you loose anything else from me? Any downloads or anything? Let me know and I will get them to you. No need to let computer trouble slow you down on your path to wellness! I just wanted to give you the link to the class you will be teaching at Cups Culinary. We are very excited! Thanks Jonna! I am looking forward to the class and to seeing you at the Cups Lounge soon. Have a great holiday.